The Reichert PDM Digital PD Meter utilizes the latest technology for measuring interpupillary distance and right/left pupil-to-nose distance. 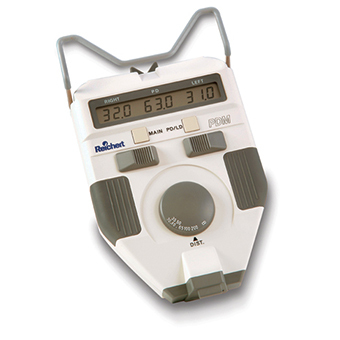 The PDM's ergonomic design, smooth action, and user-friendly LCD screen enable fast and precise PD measurements. Obtaining accurate inerpupillary measurements with the PDM is easy. Operators simply align the measuring lines to the Purkinje images on the patient's corneas. Measurement data can be obtained for a single eye, or both eyes, and results are accurate to within 0.5 mm. Interpupillary distance for a range of focusing points can be obtained by selecting the appropriate focus distance on the circular dial. The PDM's LCD displays measurement data in a clear, easy-to-read format. The PDM is ergonomically designed to be easy to hold and measure at the same time, while the forehead bar fits the patient's forehead comfortably. The PDM controls operate smoothly and are easy to adjust. Meets ALL your lensometry needs.